The California Milk Processor Board (CMPB) and AOR Gallegos United are introducing the dairy brand's first r consumer loyalty program to reward consumers who purchase milk with cash-back benefits. 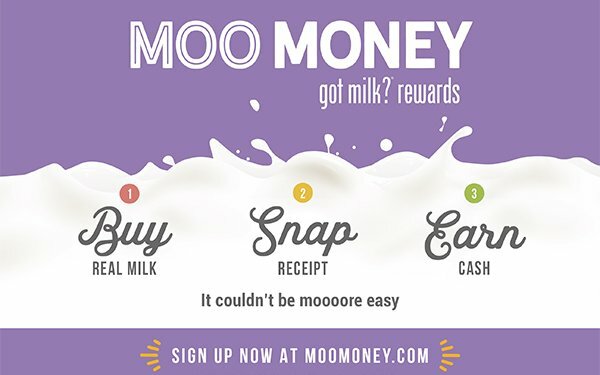 California consumers participate by registering at MooMoney.com and then submitting a photo receipt to the portal through April 28th of any real dairy milk in any size container at any retailer (online or in-store) purchased in the state of California. As members accumulate valid receipts, earned Moo Money points will accrue in their accounts that they can then be redeemed for cash, which will be delivered via a link to a virtual reward card PDF. This card will be available to be used anywhere MasterCard is accepted at any time prior to June 1, 2019. To help encourage enrollment across the state, this campaign is supported with paid media designed to reach 80% of likely dairy shoppers via both terrestrial and online radio as well as in-store media. In addition, PR and influencer efforts will help build awareness, followed by targeted digital activities — specifically display, video, social, search — all to drive registrations to moomoney.com. Following registration, new members will be targeted with tailored programs that, as an example, reinforce the benefits of real milk.